Kinetic Art is my passion and life. Why Kinetic? Well, the difference between static normal sculptures and Kinetic Sculptures is that Kinetic Sculptures actually move. They can move by wind, water, by hand or even by motors. This motion aspect is why I am so passionate about them and also what makes them so special and unique. 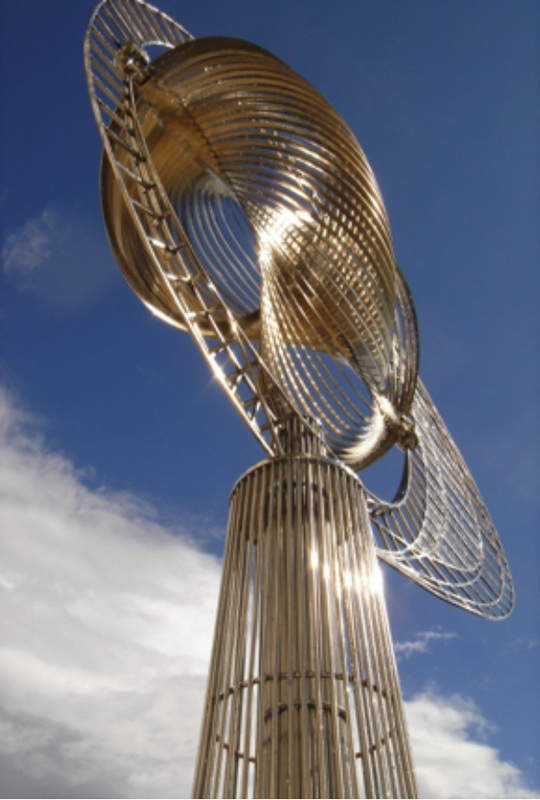 Kinetic Art has been described as the natural evolution and next step in human art development – first humans drew lines on cave walls (one and two dimensional) then they started to model sculptures (three dimensional) THEN they added time and “change over time” as the next component in Kinetic Sculptures and thus added the fourth dimension – Time – to Art. So here is where kinetic artists explore the fluid intersection of ART & SCIENCE, where Art moves, changes and communicates and interacts with the environment (wind, water, etc.) and the viewer. I strongly believe, that Art viewing should really be a conversation or two-sided communication between the art and the viewer. The one-sided, passive viewing of a still piece of art is changing to actually interacting with the art, where the viewer actions actually change the art, and vice versa. I am so happy to be on the forefront of this evolution from static to interactive and kinetic public art! My passion for engaging the public with art that changes started over twenty years ago. I was educated both in Europe (Bachelor Degree) and in the USA where I first received a USA Bachelor Degree and then a Master of Business Administration Degree (MBA) from the Wharton School of Finance in Philadelphia. After some years in the business world, I was finally able to follow my heart and passion for Kinetic Art. 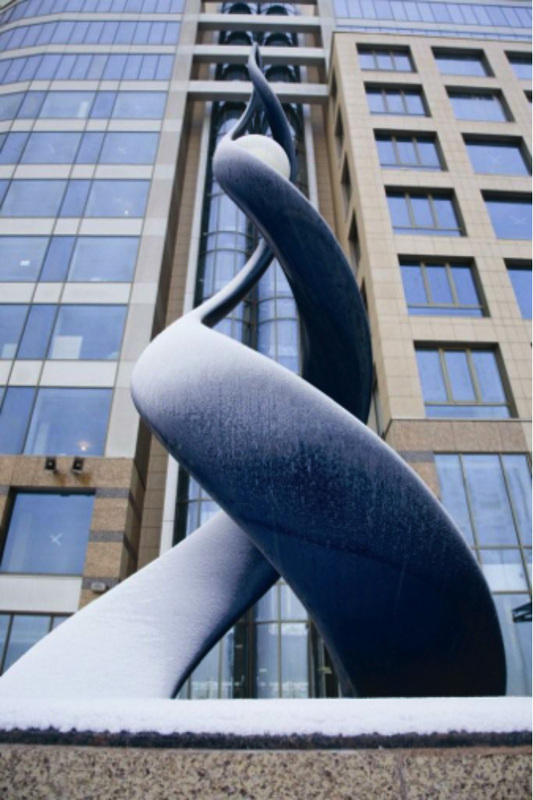 In my own development to become a master sculptor, I too started first with static sculptures, such as EVOLUTION (3m). 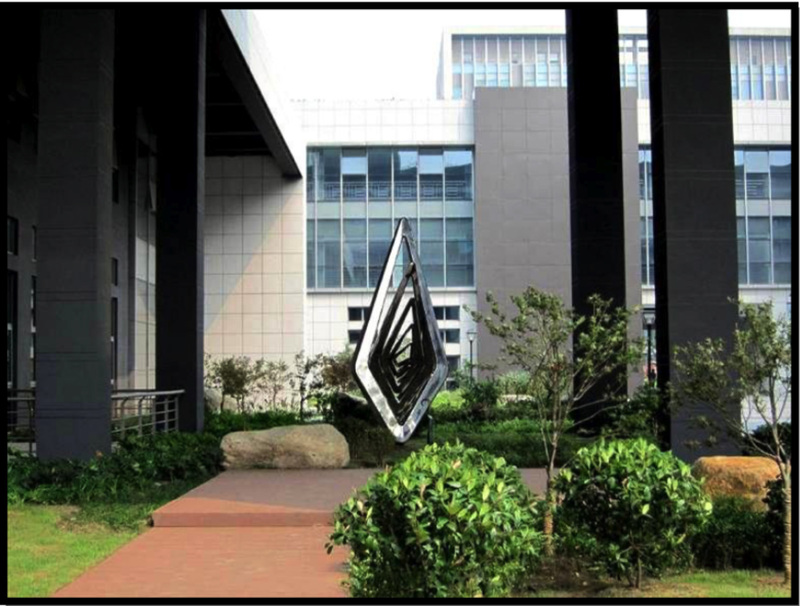 Although the sculpture is still and static, it is the viewer who must move around the sculpture, in order to see the 36 different reflections of reality in the mirror-polished leaves. 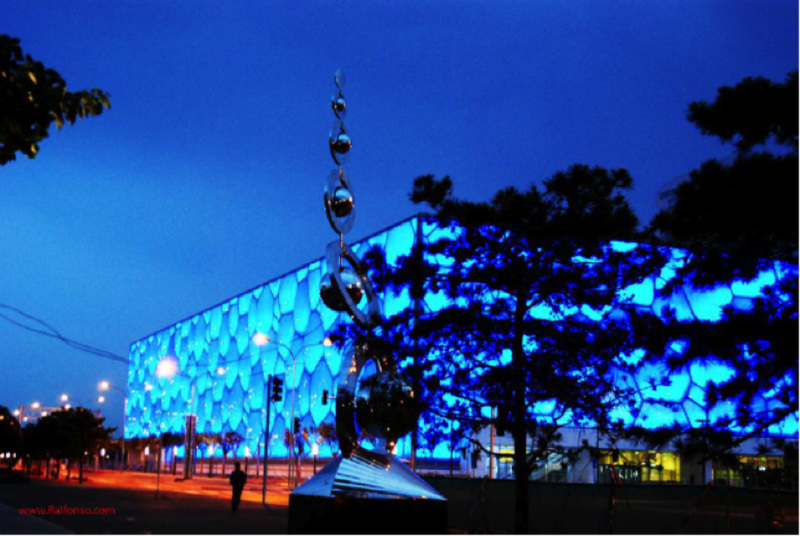 In China you can find examples of my kinetic public sculptures such as DANCE WITH THE WIND, which was installed for the Beijing Olympic Games in 2008, UNION Group of Wind Sculptures (6m) installed in Changchun, BIRD OF PARADISE in Wuxi, the AD INFINITUM sculpture (7m) in ZHENGZHOU, and the EX STRATA (6m), which was commissioned and installed for the 100 year anniversary of the Tsinghua University in 2011. EX STRATA takes advantage of an SMS cellphone receiver, so it changes its lights according to SMS messages sent from any cell phone in the world. 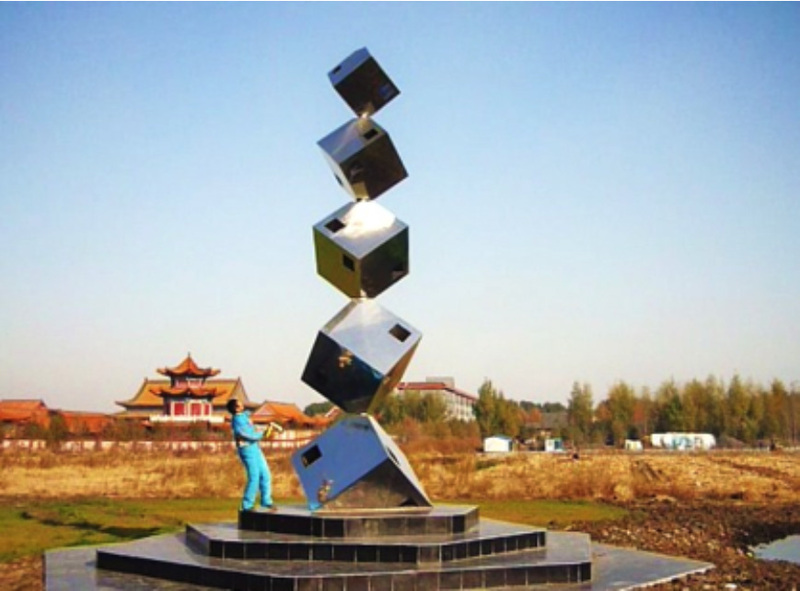 I am very honored and happy, that one of my recent sculpture installations in China is also in the beautiful Changchun sculpture park. It is called CUBE TOWER (8m plus base) and it consists of 5 cubes, which are vertically assembled on their edges. Due to the wind channels in each cube, they all move in different directions with the wind. Along my path and artistic journey of discovery, I have met many other artists that also work in the Kinetic Art field. Together we formed the KAO (Kinetic Art Organization) of which I am the President. KAO now has over 1,000 members from over 60 Countries around the world. 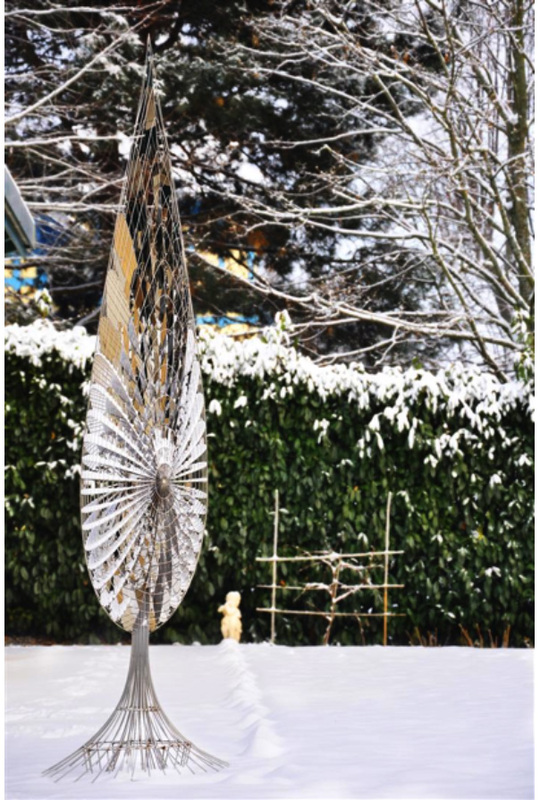 I have been very fortunate that my kinetic sculptures have been exhibited or installed in Russia, the Netherlands, Hong Kong, the United Arab Emirates, Germany, France, USA and my native Switzerland. All my sculptures have in common that they are KINETIC & INTERACTIVE, in this case they all move with the wind and thus change their appearance continuously. With a classical traditional sculpture it is always a one way communication, from the viewer to the art. It is only the viewer who does the viewing and thinking. The art is forever still and passive. My goal is design truly new, never before see public sculptures, which actually can “see” and “hear” the viewer, and can communicate directly with them, and change accordingly and interactively. 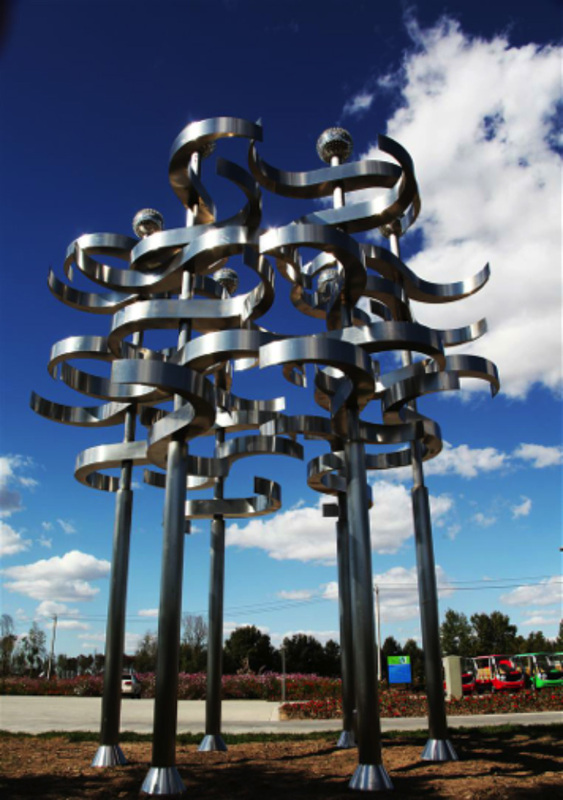 As these interactive sculptures are also connected to the internet, they can be seen via webcams, and interacted with via the computer and Smartphone Apps from anywhere in the world. The big advantage is that for the first time a viewer does not have to be in front of a sculpture to see and interact with it. With the new technologies and techniques, art can be viewed and changed from anywhere in the world. 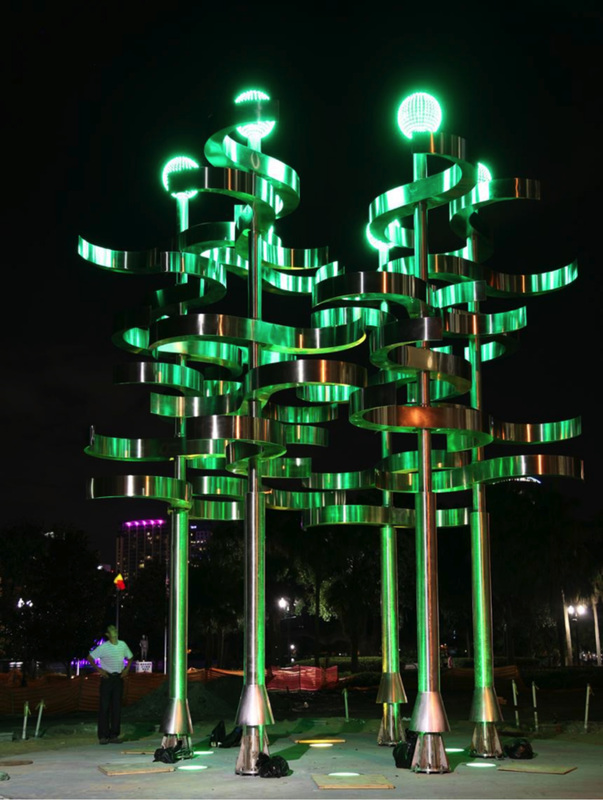 My latest installation UNION #2 (8m – 25ft) is in the beautiful central Eola Park in Orlando, Florida, USA. 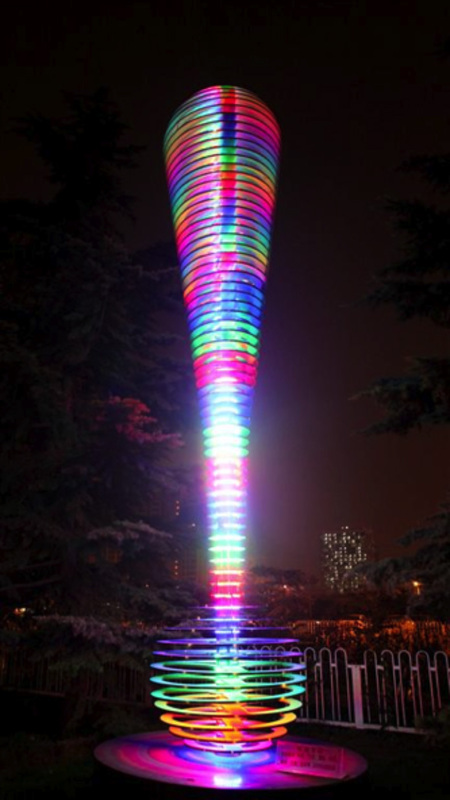 It is connected to the City Color Light System, shares sounds and moves in the Wind – see below. In summary, I am more than excited to be part of this new art frontier, and look forward to meeting some of the many people, who are interested and also enjoy this new, dynamic, interactive type of sculpture for public places.